Blanch the celery for 3-4 minutes, drain and cut into small pieces. Cut the aubergines into cubes without peeling them. 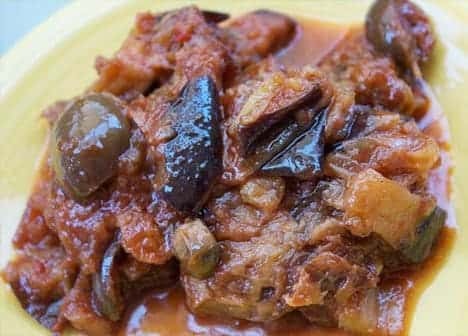 Heat the oil in the terracotta pan, toss and fry the sliced ​​onion and the garlic cloves, add the aubergines, the celery, the olives, the tomato pulp and let it boil for 10 minutes. Then add the capers, pine nuts, vinegar with the sugar mixed, salt, pepper, mix, cover and continue to cook for other 30-40 minutes. Remove from heat and serve hot or cold in the cooking vessel. Do you know this recipe for Sicilian cuisine? Contribute to this project too! Publish your images of "Palermo caponata".